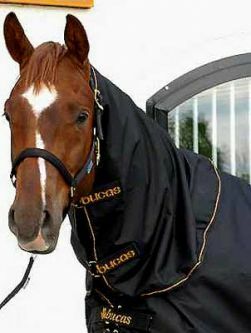 European Size: 69" 72" 75" 78" 81" 84"
The Bucas Power Turnout has a ballistic nylon outer, is waterproof, breathable and has a heat reflective inner aluminium coating. Shoulder darts and Click’n Go front buckle system means the Power Turnout is always the perfect fit! 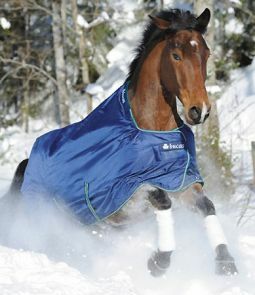 The Power Turnout also comes with Stay-dry Anti-Bacterial lining which means the rug can be put on a wet horse the same way as a sweat rug. 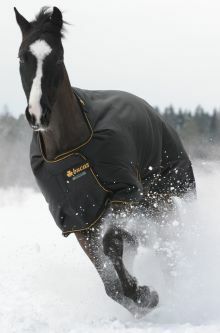 It will quickly dry the horse and can be left on, thus avoiding extra rug changes. Available in a Classic cut, with a Combi Neck sold separately, and Big Neck style. The Power Turnout Big Neck is a great rug for stallions and breeds of horses that tend to be wider across the shoulders like Friesians, Andalusian and Draughts. Big Neck style is special order.